Feel free to contact me if i have missed any films. Universal Picture’s silent film staring Lon Chaney, Sr., The Man of a thousand faces in the roll of Erik the disfigured genius who haunts the opera. In his portal of the Phantom he gives off an incredible realistic feel of the character. Passionate and terrifying at the same time, Lon Chaney’s Phantom of the Opera is still the best as far as Leroux’s novel goes. Accomplished through pain staking shots and incredible make-up this film has positively the best unmasking scene ever in all the history of Phantom of the Opera movies. Mary Philbin as Christine does a somewhat hammy job, but somehow gets the point across to the viewer. The set of the Opera house still stands today on the Universal Studio back lot in Hollywood, Stage 28. A comedian and dancer dreams that he goes with his wife and friends to a theater populated with characters from horror literature. A bloody serial killer Phantom kills and slash chorus girls. Reported to be very Leroux faithful, the makeup was said to be based off of Lon Chaney. 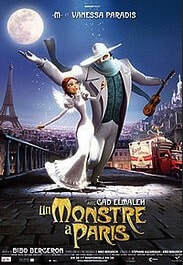 Aldo (Tin-Tan) and his girlfriend Lucy reopen an abandoned opera house, but find out that the place is inhabited by a group of Phantoms wearing the Claude Rains' 1943 "Phantom of the Opera" costume. Based on the story of a Chinese revolutionary Jin Zhicheng, this was a re-production of Ma Xu Weibang's work in 1937. In the early years of Kuomintang's reign, an opera actor Song Danping was a revolutionary who fell in love with Li Xiaoxia, the daughter of a warlord called Li Xianchen. Song was later prosecuted by the warlord's deputy Tang Jun and became deformed. 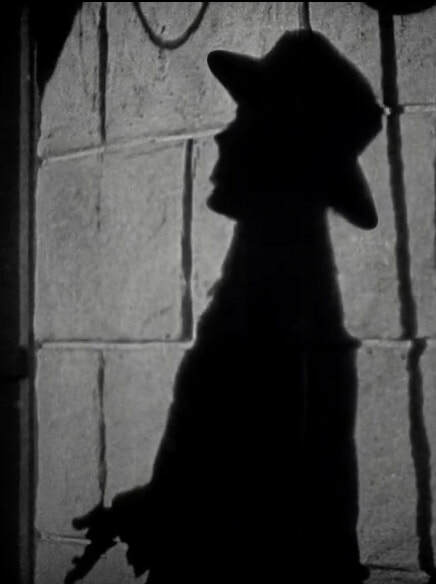 With rumours that he was already dead, Song hid himself in a deserted tower in the theatre. Li was so sad and shocked on hearing the news that she became demented. Her father then moved her into a resort in the countryside. Song felt sorry for her and tried to comfort her by singing at midnight.One day, a new opera troupe came to perform at the theatre where Song was hiding. Song knew the main actor Sun Xiaogou had been well known for strong resemblance to himself and asked him to visit Li. Song had hoped Sun could become Li's lover, but Sun had already had a girlfriend called Liu Die, who also worked in the troupe. Tang was fond of Liu's beauty and raped her. He later found that the troupe was organised by a group of revolutionaries and wanted to kill Sun, their leader. In a fierce struggle, Liu died to save Sun. Song appeared to help and Tang was finally killed. Song was then chased by the warlord's men and jumped into the river.Meanwhile, Sun rushed to the resort to tell Li the whole story. Only until then did Li know Song had not died. She hurried to the riverside with Sun, but it was too late. Li Xiaoxia thought her lover Song Danping had died, and asked her father if she could become a nun. Her father, the warlord Li Xianchen, was outrageous and beat her with a cane. Soon the Japanese invaders were approaching, thus the warlord sent his daughter to Shanghai for shelter. Song jumped into the running river but did not die. After some time he came to Shanghai where he joined the anti-Japanese guerilla headed by Sun Xiaogou. Song killed a number of Chinese traitors and earned himself a name "the midnight man". The warlord wished to marry his daughter to Wu Shaoxiong, a traitor, so that he could retain his power during the Japanese invasion. Sun knew about this and asked Li if she could engage to Wu and gather intelligence for the guerilla. Li promised. Soon Li's plot was discovered and Wu wanted to kill her. She was then brought to a deserted temple in the countryside. It was Song who saved her. In the middle of their conversation, Li took away Song's mask by accident and was horrified to see his deformed face. Without recognising Song, she fainted almost immediately. Knowing that Sun had asked Li to collect intelligence for the guerilla, Song returned to the guerilla's headquarters to ask why he did so. Unfortunately the headquarters had moved and was then occupied by Wu's men. Song was arrested red-handed and put to torture in a jail. By coincidence the guerilla's headquarters had moved to a hidden hall in the deserted temple. Sun and his comrades found Li and helped her recover consciousness. Then they discussed how to rescue Song from the jail. Only until then did Li realise the deformed man was her lover Song. She left in secret to see Wu, hoping that he would put her in jail where she could meet Song again. And Wu did. On the day of Song's execution, Li rushed to him and they died holding together. Hammer production is positively the most off version as far as I am concerned. 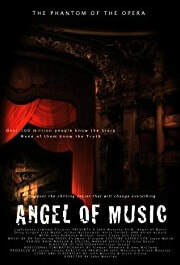 The story is set in a London's Opera house where a young girl wishes to become a singer at the opera. Latter finds the director has other plans for our Christine. Befriended by the half owner we see a story unfold. The Phantom is not scene till the end of the movie in which we find out that this is just an other acid burned psycho and nothing more. Uncreatively masked with something that looks like it was found in a dumpster. The Phantom is devode of anything we would recognize including personality only he seems more violent. He writes an opera, Romeo and Juliet, which was stolen. Christine performs in it under the Phantoms teachings. There is now a hunchback servant to The Phantom which resembles Igor. I'd give it a negative if I could. I hate this version. I bought the movie without viewing it first, stupid me, and now it hides in the back of my movie closet. Just for a few examples why I hate it; Christine looks like a guy no really, Phantom is pudgy and hits Christine when she does not obey him. Murders taking place on the back lot of Worldwide Studios turn out to be the work of a disfigured actor who has been living there for years and will stop at nothing to cease the sale of the back lot to developers. The film seems to place a lot of emphasis on the chalk outline and one character is even heard to quip, "We're going to be running out of chalk," while standing over a murder scene in a dry pool on the set. Jane Seymore and Maximilian Schell star in CBS's made for TV movie. It was broadcasted in 1983. The setting is in Hungary Budapest before the first world war. Yet another acid burned Phantom, but there is so much more to this film that meets the eye. Sándor Korvin the conductor loses his opera ingénue wife to suicide due to a bad review because she rejects the owner's advances and he ruins her career after her debut. Sándor Korvin then seeks out the one who wrote the review and in doing so get burned in the brawl. He will emerge later when a new singer, Maria, appears and captures his heart. Who shocking reminds him of his late wife. This film features some interesting takes on the story, and the unmasking scene is close to Leroux’s expiation and almost word for word from the book. As I watched this movie I saw where ALW, Yeston/Kopit, Susan Kay and Robert Englund's versions got some of their inspiration. Definitely a must see. LiXianXia, daughter of gentry LiXianChen, fell in love with actor Song Danping and Lee Hsien Chen disagreed with her daughter and the actors, and instigated Xiaoxia's cousin to obstruct it. However, Song Danping not only did not flinch, but loved more deeply. One night, Song Danping on the way home was destroyed with strong nitrate. His face became very horrible, he could no longer step on stage and could not see his beloved. Li Xiaoxia could not withstand this sudden blow, mental disorders. When Xiao Xia learned that Song Danping was unwilling to let her see her ugly appearance before she could not see her, she decided to blind her eyes with a gold needle. Xiao Xia Xiaoyu want to set fire to death Song Danping, Xiaoxia rushed into the fire and died with him. A man buys an old, abandoned theater and puts on '50s-type rock shows. Then people start being killed in a rash of "accidents". A pretty Leroux faithful Cartoon although very low budget. A guy called Eric owns a huge house and some greedy people want to build a mall over it. So they get someone to burn down his house. Eric is badly burned but does not die although everyone thinks he is dead and a year later the mall opens. What they don't realize is that Eric is living underneath the mall and he's very angry! It'sA remake of 'Song at Midnight,' a classic 1930's movie see Ye Bang Ge Sheng 1961. Even though this version is very different with some fairly disturbing Japanese traditions I really liked it. The Phantom or Mr. Song is kind of pathetic, but he has some redeeming qualities in the end. It was very entertaining even though it is dubbed. You soon forget that it is. I suggest this versions be added to any collection. ​A doctor manages to separate a man's spirit from his body which runs rampant in Paris. The police decide to perform an autopsy when they discover the man's corpse, forcing the spirit to race back as fast as it can to stop the police from making the first incision. A demented physician becomes obsessed with a young singer whose voice sounds similar to his late mistress. Retelling of Edgar Allan Poe about a group of players in a penny dreadful thriller-play who become targets of murder themselves. It has some Phantom elements. The Grandview is a sprawling Californian hotel with a terrible secret: single blonde visitors who check in don't check out. Hotel detective Rick Stewart (David Bailey) begins investigating what's happened to a handful of vanishing guests but he soon becomes personally involved when his brunette ex-wife, Lisa James (Tiffany Bolling), arrives for a singing engagement at the hotel. When Lisa dons a blonde wig for her performance, she finds herself the next target of a psychopathic killer. Remake House of Wax. Paris, 1900. As a little girl, Sonia witnesses the slaughter of her parents by a mysterious man with a steel arm. Years later in Rome, she is hired as a dressmaker at a wax museum owned by Volkoff, a sinister artist who recreates perfect replicas of famous crime scenes. A series of strange deaths in the area has led a young journalist, Andrea, to investigate the mysterious vaults of the museum. Andrea and Sonia are soon plunged into a nightmare as they both learn the secret behind Volkoff's statues and the connection he bears to the steel-armed murderer of Sonia's parents. 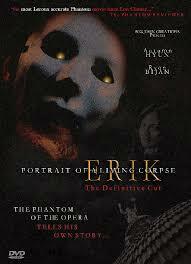 A darkly comic retelling of Gaston Leroux's The Phantom of the Opera, from Erik the Phantom's, twisted perspective. Legend tells of a hideously disfigured masked murderer who once stalked the Garnier Opera House leaving a trail of terror and bloodshed in his wake. With strange occurrences haunting the old theater to this day, a TV show investigates reported Paranormal Activity in the abandoned opera house. However when the TV crew comes to film the story at the old theater decades after the horrific events, they inadvertently reawaken the spirit of the mad composer... and the Phantom's Opera is set to reprise its bloody final act! Starring Canadian horror maestro Anthony D.P. Mann (Terror of Dracula, Ghostkeepers) and Featuring the winner of TVCogeco's "Casting Christine" television series, "Phantom of the Opera" combines the mystery of the beloved novel, and the excitement of classic chillers along with today's modern horror. After many years of research, Gaston Leroux has finally tracked down the last remaining witness who can unravel the mystery of the 'Opera Ghost'. A group of teens discover an enchanted wax museum and begin disappearing into the displays to become human sacrifices to the characters on display. Most of the characters are monster yes even Phantom is there. It's a fun movie. The Phantom as being more like a ghost, and his daughter, Phantasma, plays the organ. The Gremlins are back, and this time, they've taken control of a New York media mogul's high-tech skyscraper. Phantom unamsking scene done with two of the Gremlins. At the Masquerade Ball Red Death is seen on the stars and Selina Kyle appears behind him. Reportedly plaid by Tim Burton himself. Phantom is befiely mentioned in the movie as a point of a joke. Raphael: Well, if it ain't the Phantom of the Opera. Randomly appears in the movie. 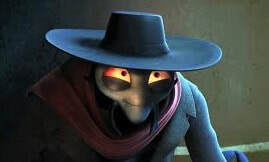 Erik is the former Phantom of the Opera and a minor character in Hotel Transylvania 2. He is the hotel's musician. He plays his melancholy music at Mavis and Johnny's wedding. He also plays his music during the dinner with Mavis and Johnny's family. Listening in on their conversation and making comments as he continues to play his music. He finally appears playing his music at Dennis' fifth birthday during Kakie's performance much to the dismay of Mavis, Dracula, and Jonathan. 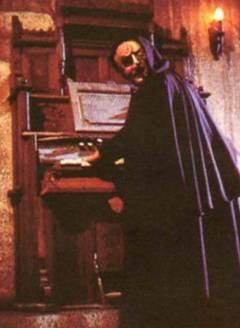 Still playing his music during the heated fight between Dracula, Mavis and Johnny they all become fed up and shout "Shut up!" Not long after checking in for the talent show, the Phantom appears in the opera house and Fred, Daphne and Velma attempt to catch him using the surveillance cameras, but are unsuccessful due to the Phantom’s ability to seemingly appear in multiple places at once. 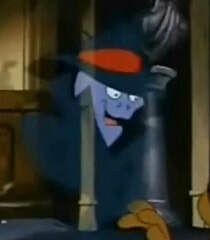 The Phantom holds the record for the most culprits wearing the disguise, five, and all for individual reasons. The "Phantom" is actually inspired by Gaston's book "The Phantom of the Opera".